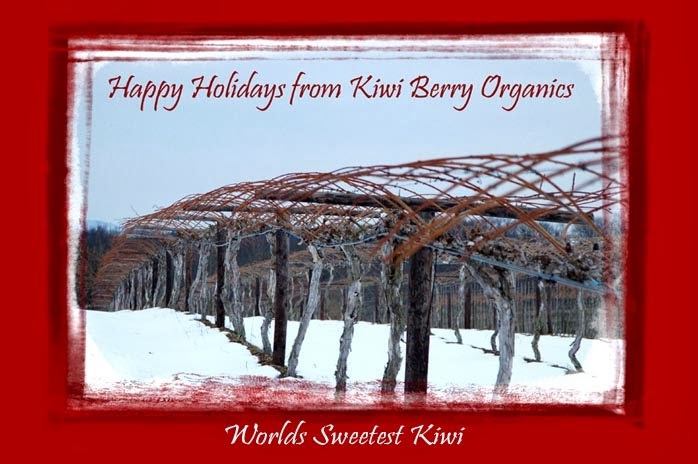 This entry was posted in Uncategorized and tagged Actinidia, arguta, Kiwi Berry Organics, kiwifruit, kolomikta, pruing. Bookmark the permalink. Trackbacks are closed, but you can post a comment. Excellent post, I never seen a kiwi before, but as you mentioned here, it is a vine kind of plant. Indeed, Kiwi fruits are nutritious and can be added to salads or even eaten alone as fruit. I just planted a very young kiwi vine and hadn’t planned on pruning – thanks for these tips. It is not on a T-system but will grow along the trellised wall of my front porch. I will train along this “wall” with the steps you describe – thank you. I can’t wait to try the fruit! Kiwifruits is my favorite. It is not only delicious, it also has lots of benefits when it comes to our health. I was wondering if you could trellis raspberry bushes under the kiwi using the same support posts? I’ve never grown either and would like your thoughts. Great post! Interesting idea with two potential problems. 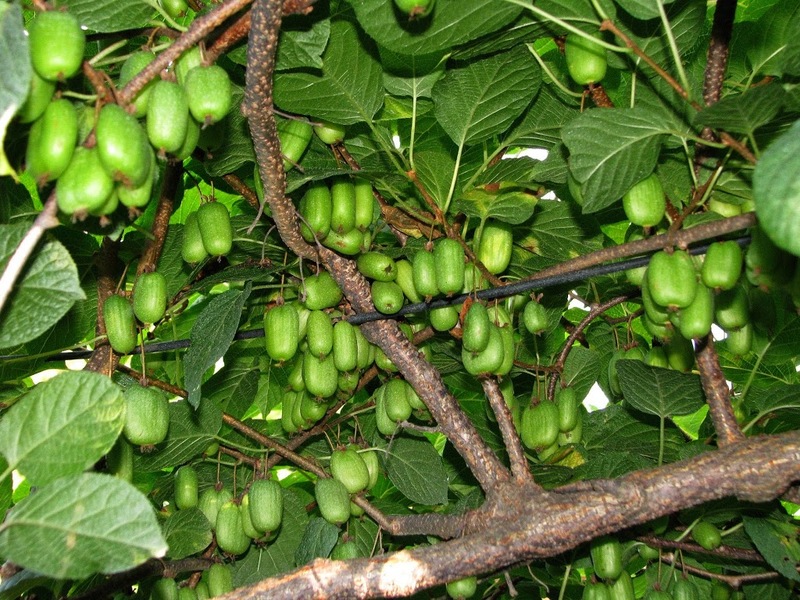 One is that it would make it hard to get at the kiwis to prune and harvest — and the kiwis need multiple prunings each year. 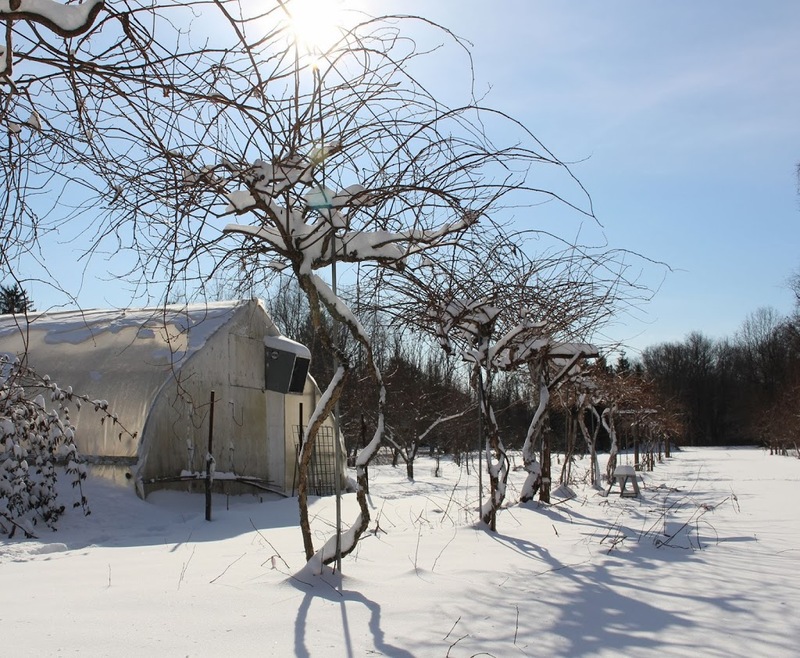 And second, the shade would limit raspberry production and make it easier for fungal disease to take hold. Do you get late spring frosts? If so, how do you deal with them? It’s late April and we are expecting a freeze tomorrow (zone 5b/6a, btw). I have wanted to grow kiwis for years but the more research I do, the more I read how early blooming and how frost sensitive they are. I’m thinking on passing on kiwis but I’d love to try it if you have a trick. Yes, I get spring frosts. The way I deal with them is, unscientifically, by keeping my fingers crossed. But seriously, whether damage occurs depends on the severity of the frost, the stage of plant growth, and, perhaps, the age of the plants. A light frost usually does little or no harm. New sprouts often develop if older ones have been nipped. Plants seem to tolerate frosts better with age, which could be a microclimate effect as canopy develops. Please tell me the names of your kiwi plants. 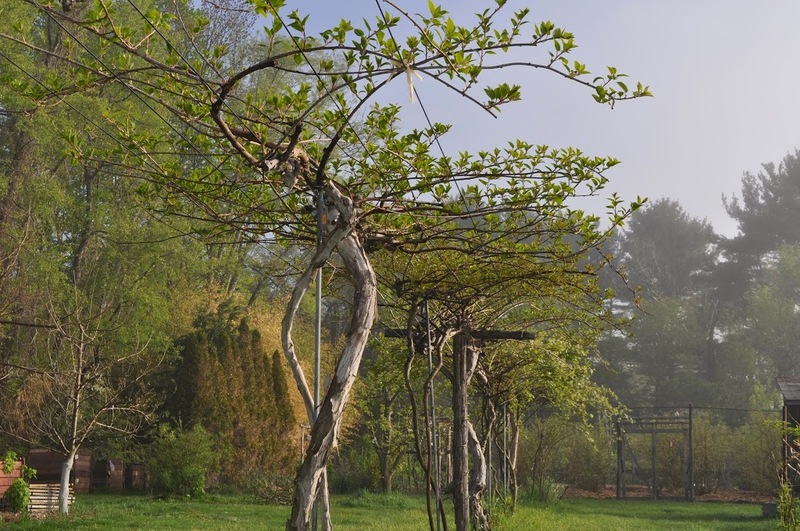 I live in NC and would like to plant a few kiwi plants that someone can tell me are really sweet and worth the time to build a trellis for and tend to. Thank you so much. All the hardy kiwis are worth the effort. Among Actinidia arguta, I’d recommend Geneva and Dumbarton. Any of the A. kolomikta varieties seem good. See my book Uncommon Fruits for Every Garden for more about these wonderful plants. I think the pruning used to delay/advance grapes would also work for kiwis (or, probably, and other plant). Would that be pruning later in the dormant season to delay growth? I would have thought the kiwi bloom times long enough so that there would be sufficient overlap even if 4 days out of sync.